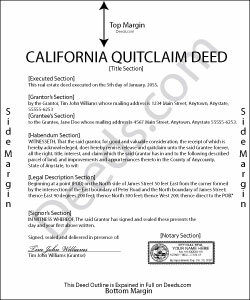 Quitclaim deeds in California are initially defined by Civ. Code, 1092, 1104-1107, 1113, and further in Gov. Code 27279-27297.7, 27320-27337. Each document submitted for recording should have the title near the top of the first page (Gov. Code 27324). Include the name and address of the individual requesting recording as well as a name and return address for use after the quitclaim deed is recorded. Provide the name and address of the individual or entity to receive tax bills at the bottom of the first page. (Gov. Code 27321.5, 27361.6). In addition, every quit claim deed must contain the name and address of everyone with an ownership interest in the property. Be certain to present the names in exactly the same way they're found on the prior deed. If there are any unrecorded changes, provide the original and new names like this: Jane Doe, formerly known as Jane Smith. See Gov. Code 27288.1. Any document which modifies, releases, or cancels the provisions of a previously recorded document shall state the recorder identification number or the book and page of the document being modified, released, or canceled. (Gov. Code 27361.6). Additionally, Gov. Code 27280.5 requires that the names of parties required to be indexed appearing in any instrument, paper, or notice presented for recordation should be legibly typed or printed near the signature. The names of all persons executing or witnessing a document shall be legibly signed or shall be typed or printed to the side of or below the signature. While not specifically discussed in the statutes, a valid quit claim deed should also include, at minimum, a complete legal description of the property and the name, address, and vesting choice of the grantee. Note that Gov. Code 27293 requires that quit claim deeds in languages other than English are not suitable for recording. Civ. Code 1169 states that quit claim deeds must be recorded by the County Recorder of the county in which the conveyed real estate is situated. Civ. Code 1213-1214 discuss California's recording statute, which is classified as "race-notice." Basically, the first bona fide purchaser....will prevail over an earlier purchaser who failed to record the conveyance. So, despite Civ. Code 1217, which states that "an unrecorded instrument is valid as between the parties thereto and those who have notice thereof," just because the parties on the quit claim deed know about it, their knowledge does NOT constitute constructive notice to the public. Therefore, RECORD THE QUIT CLAIM DEED as soon as possible after executing it. This protects the interests of all parties. Gov. Code 27361.6 formalizes some formatting requirements: The top right 2 " X 5" corner is reserved for the Recorder's use only. The top left 2 " X 3 " corner is reserved for the name of the person requesting recording and a return name and address. The title of the document must appear on the first page immediately below the space reserved for the Recorder. Robert D. said: These forms made it so easy to update the property deed and the instructions and sample filled out form were most helpful. You might want to add some brief information on when or why to use the Acknowledgment in Individual Capacity notary form. In my case the notary was required to use it but also filled in the brief notarize section on the Affidavit as well. She said the one on the Affidavit had some value because it showed she had witnessed the my signature. But this was only after I suggested both be filled in as she initially thought to just strike through it and just use the Acknowledgment in Individual Capacity form. Sallie S. said: Great speedy service with access to areas beyond my reach. Reply from Staff: Thank you Sallie, have a great day!